At the start of the film, a cantor (Röhrig) is mourning the death of his wife, where she left him and their two middle-school aged sons to grieve. In the Jewish religion, it is tradition to bury the deceased very quickly without embalming. In this case, she was buried the same day. Everyone grieves differently, but the cantor who goes by Shmuel, becomes obsessed and severely curious on how his wife’s corpse will decompose, hoping her soul and body are at rest. He even has some vivid nightmares about this situation, which is done perfectly with stop motion capture. Since Shmuel is basically cut off from the normal world due to his religion, he has nobody to talk with, which brings him on the adventure to seek out a scientist/doctor to help him understand the decomposition process that leads him to Albert (Broderick), a community college science teacher. In fact, I’d like to think Broderick’s character Albert is actually the new character from ‘Election‘, who has worked his way back up the school system. Shmuel and Albert’s friendship isn’t love at first sight as the Jewish tradition and language is a comedic barrier, but you can tell there is a light spark of friendship there. 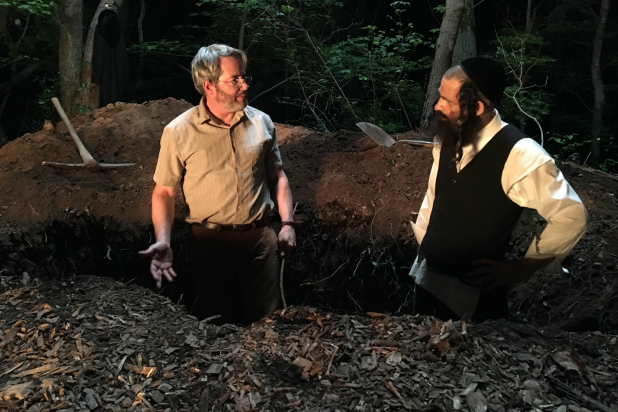 From here, the curiosity out of both men, lead them on some hilarious adventures and science experiments to see how fast a body can decompose, one that includes a not-so-kosher pig, which plays out like a slapstick scene from a Leslie Nielsen movie. Meanwhile, Shmuel’s two sons are trying to cope with friends at school about their now-crazy dad being a dybbuk, which also garners laughs, but at the same time seems sweet and charming. The crazy mashup of dark comedy and tragedy here, in addition to the strange friendship wouldn’t work usually in a movie, but with both Röhrig and Broderick’s chemistry and talented performances, this film is home-run. You won’t see anything like it this year and if this is what we can expect from director Shawn Snyder – count me in for much more. This entry was posted on Thursday, February 7th, 2019 at 9:58 am	and is filed under Film, News. You can follow any responses to this entry through the RSS 2.0 feed. You can skip to the end and leave a response. Pinging is currently not allowed. « The LEGO Movie 2: The Second Part: Film Review!